American Airlines matched competitors' baggage fee hikes. 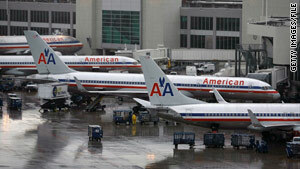 (CNN) -- American Airlines has joined its competitors in raising checked luggage fees. The airline announced Monday it would charge $25 for the first checked bag and $35 for the second. American is the last major legacy carrier to join in a wave of baggage fee increases that Delta Air Lines initiated earlier this month. The changes are effective for tickets purchased on or after February 1 for travel within the United States, Puerto Rico and the U.S. Virgin Islands. Delta, United and Continental airlines, and US Airways all are charging $25 for the first bag and $35 for the second bag checked in at the airport. Passengers who check in online on those four airlines will pay $23 for the first bag and $32 for the second. American does not offer online check-in. Video: Will passengers pay for pillows? About 25 percent of American's domestic passengers pay checked bag fees, according to the airline's announcement.